Sharon Drew Morgen » Solutions are meaningless without Buy-In. Solutions are meaningless without Buy-In. Recently I was part of an Ideation session in which an insurance company wanted web ideas to better serve their customers. Ideally, they’d end up with functionality that members would find helpful in their health care decisions, offer great customer service through added benefits, and keep them involved with the agency. What an amazing experience helping the insurance company serve their members. 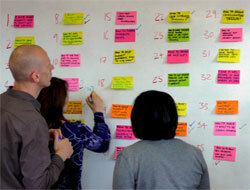 The agency set up some extremely creative exercises and group planning that allowed creative ideas to flow and soar. People gave their best, served the client and each other, with great respect and passion. Fun, creative, and successful. Or so it seemed. ARE WE CHOOSING THE RIGHT STARTING POINT FOR CHANGE? What?? If the buyer didn’t know how or when to use the ideas they paid a lot of money to get, what else didn’t they know? How had they prepared for change? What was the initial set of assumptions? Were we all creating something the client wouldn’t use? Their members wouldn’t use? Did we focus on the wrong thing as a deliverable? I then asked others from the client group how they’d know that their current customers (called members) would use the new site options, and also how they’d encourage a larger percentage – and new members – to use the site. They all replied: When new site options are available, people will know how to use them, want to use them, be drawn to using them. Ah. Build it and they will come! This is specious. Just because we know there is a great gym around the corner doesn’t mean we’ll use it. Just because we know there is a great product available doesn’t mean we’ll buy it. Indeed, sales fails 93% of the time. As sellers, we’re familiar with this. We know what buyers need (it’s so obvious), we gather appropriate data, we pitch glorious solutions that fit – they really really fit. But the buyer doesn’t buy. Why? Because the process buyers go through to decide to resolve a problem is not based on their need or our solution: they first must go behind-the-scenes to and manage their ‘system’ to get the acceptance necessary for change. We forget that the current system people make decisions in is ‘fine, thank you.’ Systems (and the people in them) don’t change behavior just because new data is available. System will stay in tact, regardless of how well it could function with an added solution, unless the appropriate buy-in (relationships, feelings, politics, rules, future actions, etc.) is achieved. Otherwise the system gets disrupted. And the status quo is favored, regardless of the rational reasons for change. and then set up a way the members could design their own functionality. Our ideation session might have been: 1. X% of members should be using the site monthly: how can we help them decide to join us in an on-line community; 2. how can we maintain site visits over time and encourage new members; and 3. help online users design the type of site they want and create community. Done right, the members would eagerly get online and buy-in to using the agency’s site as part of their life-style choices and then become part of the design process. And in a community. And the insurance agency would be greatly differentiated, maintain their client base in a competitive environment, and have a dialogue capability that would enable them to continually understand how to keep getting better and offering what members needed. As it was, our great ideas might have been under-utilized, and the client would have blamed the ad agency. Assuming that a great site would draw site visitors is dangerous. Assuming our prospects need our solution, just because they have a problem that we can resolve, is specious. No matter how ‘right’ we are and how necessary our solution, until or unless buyers learn how to manage the change that a new addition will bring, they will do nothing. Have a look at my new book Dirty Little Secrets: why buyers can’t buy and sellers can’t sell and what you can do about it. It explains this in detail. I will also be part of the Fearful to Fabulous Spring Sales Summit.